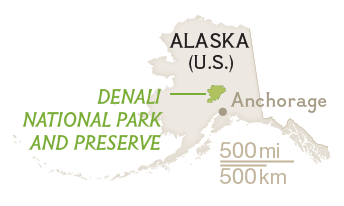 How Can 6 Million Acres at Denali Still Not Be Enough? This story appears in the February 2016 issue of National Geographic magazine. A mother grizzly and her cubs cause a “bear jam” on Denali’s 92-mile-long Park Road, open to private vehicles only five days each summer. Most visitors travel the route by Park Service bus (below), frequently spotting wildlife but rarely catching a cloudless glimpse of the park’s namesake peak. Hefting cameras and calling out in a multitude of accents, park visitors entreat bus drivers to stop when wildlife comes into view: moose, bears, caribou, sheep—and, ever more rarely, wolves. They come here to snap a few pictures and get some bragging rights about being 50 feet from a grizzly ... They go away wanting to protect places like this. The research is an extension of the pioneering work of ecologist Adolph Murie, one of the first scientists to study Denali’s wolves in the wild. In 1939, when Murie made the first of his many expeditions to what was then Mount McKinley National Park, wolves were considered vermin, and Park Service rangers had a history of shooting them on sight. Murie’s research showed that wolves and other top predators play an essential role in healthy habitats, and he argued that we should manage parks to protect entire ecosystems rather than individual species. Gliding toward one of the hundreds of untouched mountainsides in Denali’s high backcountry, a climber skis past sapphire pools atop upper Ruth Glacier. On the north side of the Alaska Range, Brooks Glacier has been steadily retreating because of global warming. Alaska’s glaciers are losing an estimated 75 billion tons of ice every year. Spreading through its broad valley in ever shifting braids, the McKinley River carries meltwater and silt down from the continent’s highest mountain range. Leading their offspring to new hunting grounds, the Iron Creek West pack’s breeding pair breaks trail through fresh snow. The pair wears tracking collars fitted by biologists. Wolves may stay near a kill site—the meal here is moose—for several days. Packs that cross park boundaries in search of prey are vulnerable to hunting and trapping. Julie Collins feeds her dogs at the homestead she shares with her twin sister, Miki. The women have led mostly subsistence lives near the park’s edge for more than 50 years. Denali rangers confiscate a moose carcass from two poachers who, according to officials, crossed a marked boundary and shot the animal more than a mile inside the park. When Arthur arrived, he found another dead wolf, this one an uncollared, pregnant female. Both wolves were members of the beleaguered East Fork pack, and incoming GPS data from another wolf’s collar made it clear that more pack members were still in the area, drawn by the bear bait. Arthur expressed his concern to state wildlife officials and suggested closing the wolf hunting season early in the local area. The officials agreed to close the season two weeks early on a onetime basis but rejected conservationists’ calls for a permanent closure. Surrounded by hunting trophies, guide and pilot Ray Atkins relaxes in his cabin near the park. Guiding is big business in Alaska; Atkins charges $14,000 for an eight- to ten-day hunting trip. A frequent National Geographic contributor, photographer Aaron Huey has trekked up Mount Everest, visited the Georgian Caucasus, and explored Indian reservations in the United States for the magazine. While photographing in Denali, did you face any precarious situations? We skied across Ruth Glacier, which meant going over fragile snow bridges and occasionally avoiding deep ice tunnels filled with water. For safety the team was tied together with a rope for all of our travel.